Why the majority of young workers leave their jobs within three years. It takes a certain blend of optimism and paranoia to sleep with your phone within arm’s reach. Something might happen—and I might miss it! Like FOMO, it’s a mostly Millennial affliction, and the younger you are, the more likely you are to have it. But unlike its better-known cousin, it’s less a social anxiety in an ever-connected world than a symptom of the always-on generation’s evolving approach to work-life balance. Because in 2014, when your phone’s simultaneously the front door to your home and your mailbox at the office, you’re just as likely to receive a midnight text from your girlfriend as you are a midnight email from the boss. And neither will have any trouble finding you, unconcerned with the fact that you’re in pajamas drifting into the night. It’s downright dystopian for the baby boomers raised on strict 9-to-5 jobs with neat separation between their social and professional worlds. 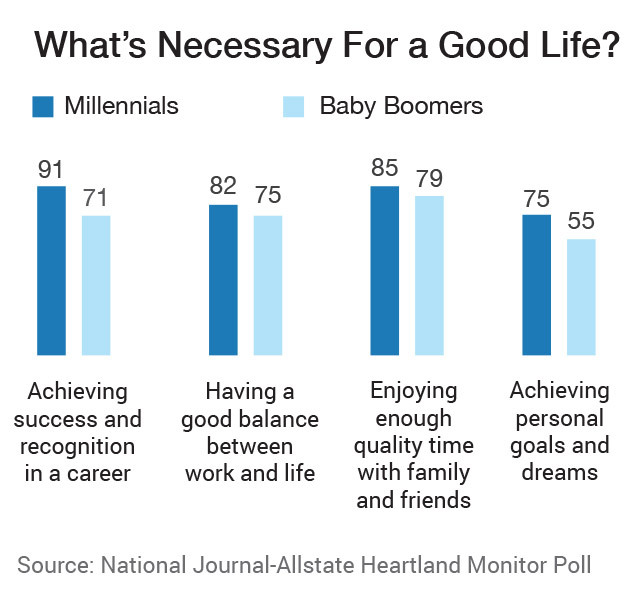 To them, a successful career and a successful life are simply different: In the 2014 Allstate-National Journal Heartland Monitor Poll, just 71 percent of baby boomers insisted that achieving success in a career is necessary to living a good life, compared to 91 percent of Millennials. Because Millennials, it turns out, are just fine with this new arrangement—as long as their employers are prepared to meet a few demands. And if they aren’t, the generation about to become the biggest contributor to the U.S. workforce has proven willing to simply inquire elsewhere. Study after study show that Millennial workers bring little employer loyalty to their careers, with 60 percent leaving within three years of being hired. At PricewaterhouseCoopers, the accounting giant, the employee exodus became so pronounced that executives commissioned a company-wide investigation in 2013 to figure out what was happening. Among its findings: “Millennials do not believe that productivity should be measured by the number of hours worked at the office, but by the output of the work performed. They view work as a ‘thing’ and not a ‘place.’” The long hours at the office and status quo work-life tradeoff weren’t working for the company’s young workers; they wanted more flexibility, so they went looking for it. These demands in the workplace fall under the “culture fit” umbrella, which Millennials offer as by far the most common reason given when leaving a company. To them, it seems, if you’re going to subject yourself to the demands of a career in 2014, with your phone on the nightstand prepared to wake up in a cold sweat and respond to a midnight work email, you at least want the person on the other side to be someone you can laugh with about it in the morning.